The ability to create tokens to control better control access to and usage of a Nightscout site was introduced with Grilled Cheese (0.9). 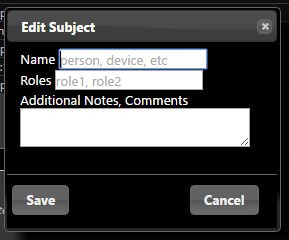 The new authentication roles (and AUTH_DEFAULT_ROLES variable) allow you to further control and limit access. If you want to ensure that ONLY someone with permission to view your site (e.g., a token) is able to view the data, you should configure the AUTH_DEFAULT_ROLES variable in Azure or Heroku. Set the value as: denied. This creates a scenario in which a token will be required for all access. readable: read-only access; no ability to make CarePortal/treatment entries. This user CAN see reports and profile information. Note: There is currently no way to limit a user so that the user can not view the Reports section, if the user has access to the site. Time/date-based roles are not currently possible. Note: devicestatus-upload is a workaround that should only be used with older uploader applications. Click the “Add New Subject” button. Fill in the name of the subject and the “role” you are giving this subject (from the list of roles shown). You can edit a subject by clicking the edit icon, making changes, and saving. You can delete a subject by clicking the “x” icon to remove the subject from the list. If you provide a user a URL with a token, the user will see the main URL for the site and could access the site through the URL (without the token). Submit any bugs, feedback, or issues via GitHub.